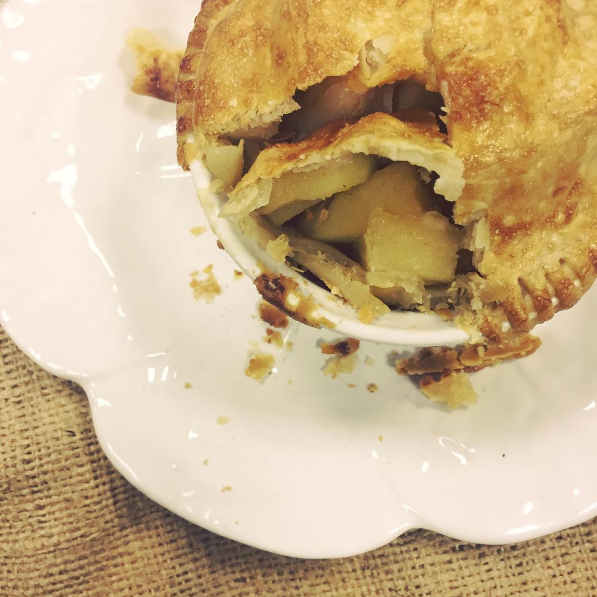 Use store bought pre-rolled pie crusts OR if you're feeling adventurous, click here for the best DIY pie crust instruction from Melissa Clark. Turn out your pie crust and place your ramekin upside down on top. Cut a 2" larger circle, an drape/mould pie crust into dish. Save scraps for topping. Mix/toss with granulated sugar, lemon juice, cinnamon, ginger, chosen spices. Fill the dough lined ramekin with apple filling, top with more crust of your style choice (round, lattice, scraps). Seal with the tongs of a fork, brush with milk or heavy cream & sprinkle lightly with sugar and a touch of ground cinnamon. Bake according to pie crust directions until golden brown, about 15-20 minutes. Serve with favorite ice cream. Note: For the best DIY pie crust users, roll out to 1/8" thickness and follow same steps.